Great progress on the Mustang build, Chris. 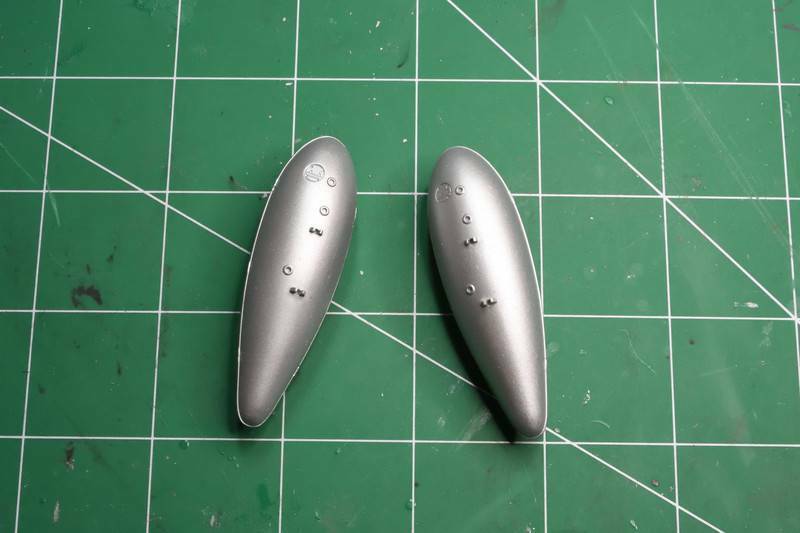 Thank you for your review on the MM exhausts... it's neat to start seeing more 3D printing products for modeling. You may already know this but Mr Surfacer shrinks a lot so it is advisable to check on your fills 2-3 days after. Hi Peter! Good to see you here again. John, Actually, I didn't know that about Mr Surfacer but I was just gone for five days so will DEFINITELY keep an eye on where I used it. Good to know! 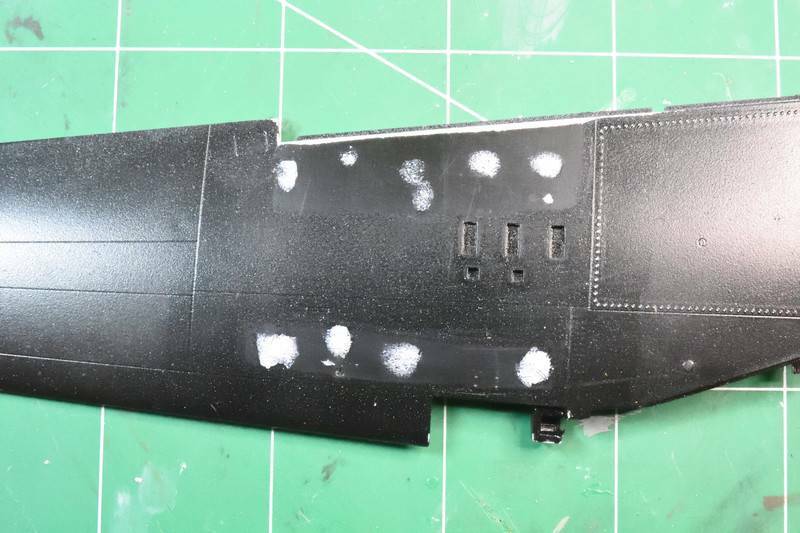 Making slow progress here, filling in some details as I wait on some addl research on the right side of the aircraft. 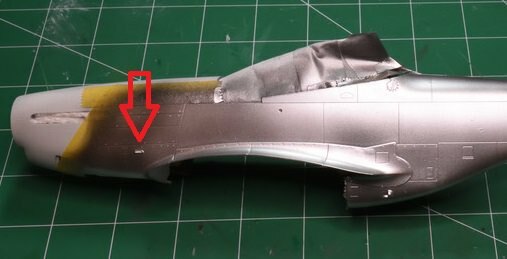 Taking care of the mold ruts on the landing gear covers and some touch up on those little dots on the underside of the wing. 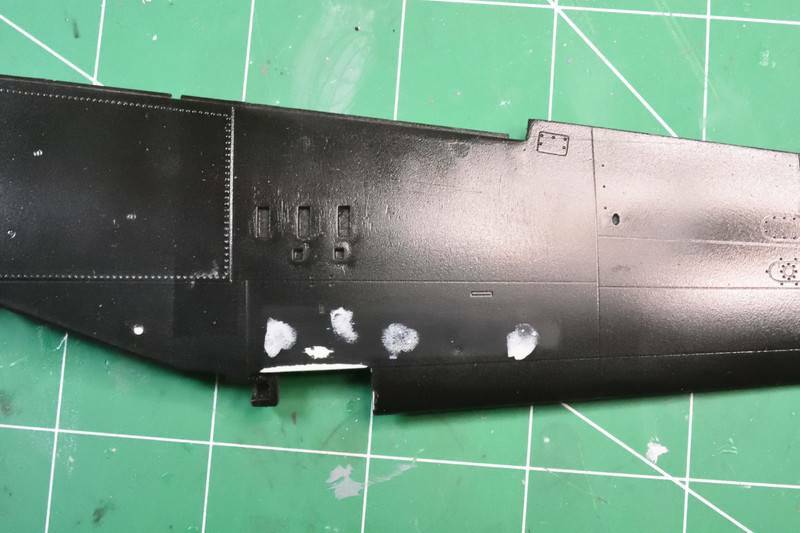 Tried out some sanding, and then hit it with the gloss black primer to see how it turned out. Not too bad, but the Mr. Surfacer did shrink on the other side as shown byt he sanding. Ditto on the underside of the wing. 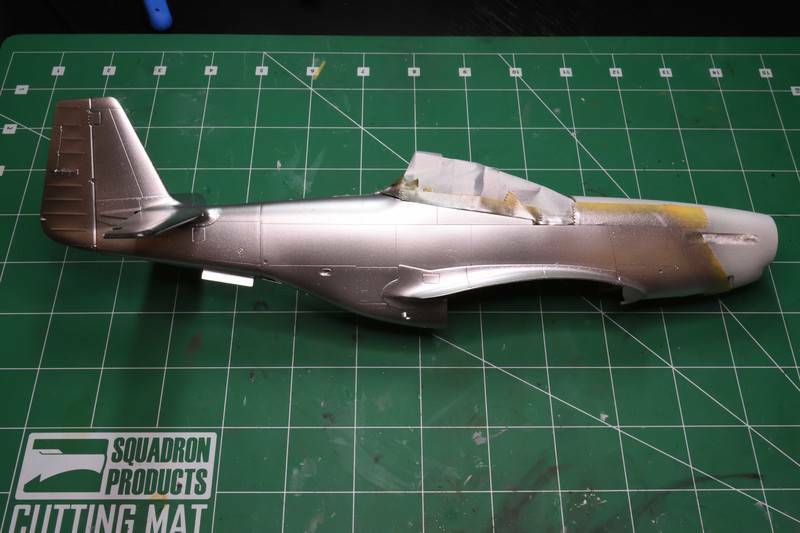 I keep wavering between shiny drop tanks and tanks that seem to be a bit flatter in hue - so after a nice sliver coat, I decided to lay down a coat of neutral gray. I think these will be fine - and planning on plumbing them. 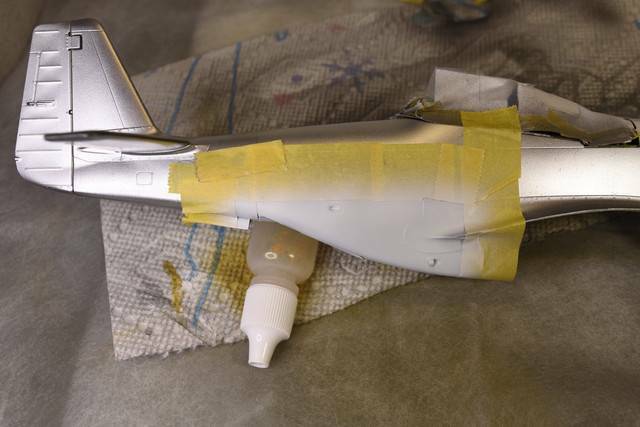 Put down a base coat for the silver on the fuselage. 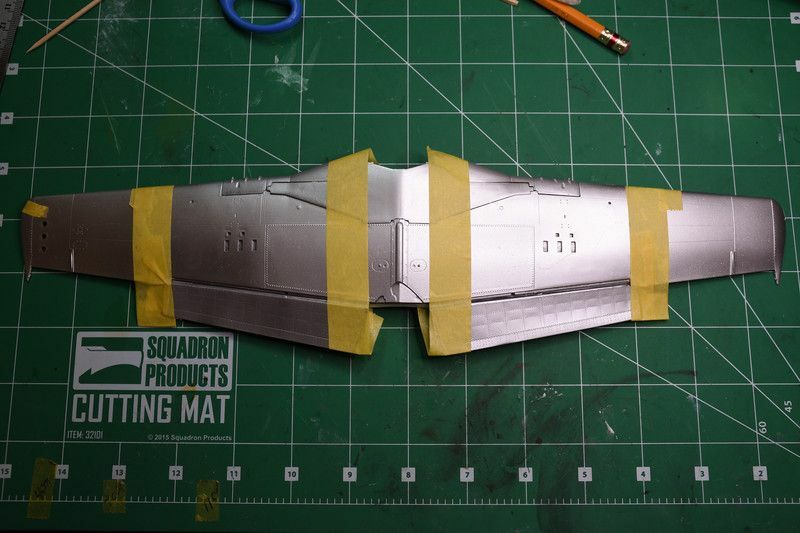 Masking tape is coming up a bit on the right side, will take care of that. A few remarks if you don't mind. 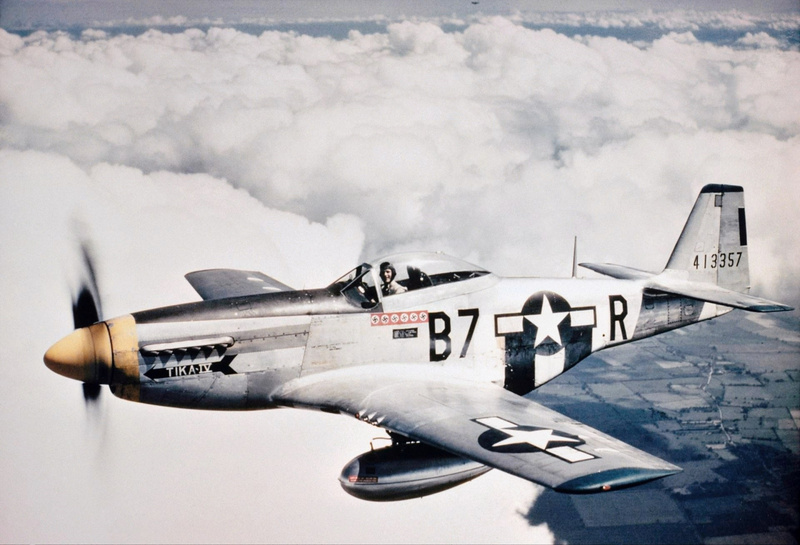 The drop tanks were usually in newer shape than the aircraft itself as they were discarded during combat and new ones installed before each mission. So I would make them shinier than the rest of the airframe. What kind of bright silver are you using? After testing, I found out that it is near impossible to properly fit the exhausts inside the shrouds once the fuselage is closed. So I installed them early on before I closed the fuselage. 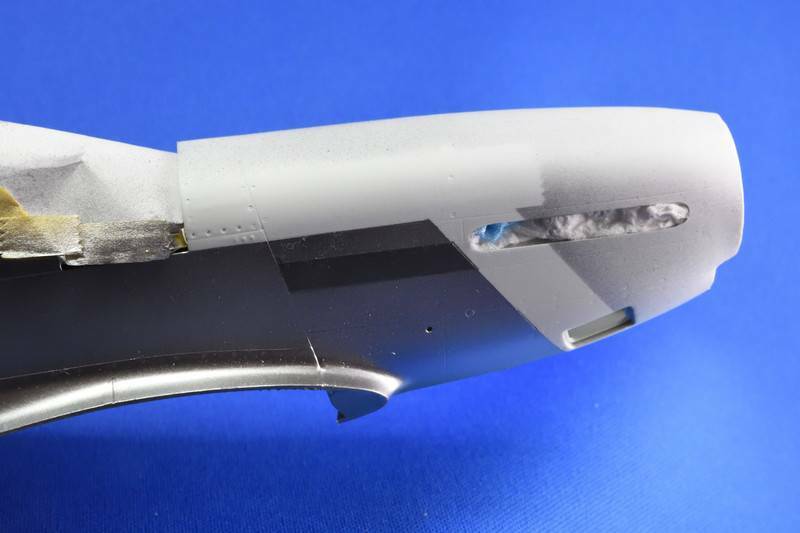 I admit it will be tricky to mask them off to paint the nose but it's the price one must pay unless one likes the sound of loose parts rattling inside the fuselage! Thanks for all of your comments - very much appreciated! 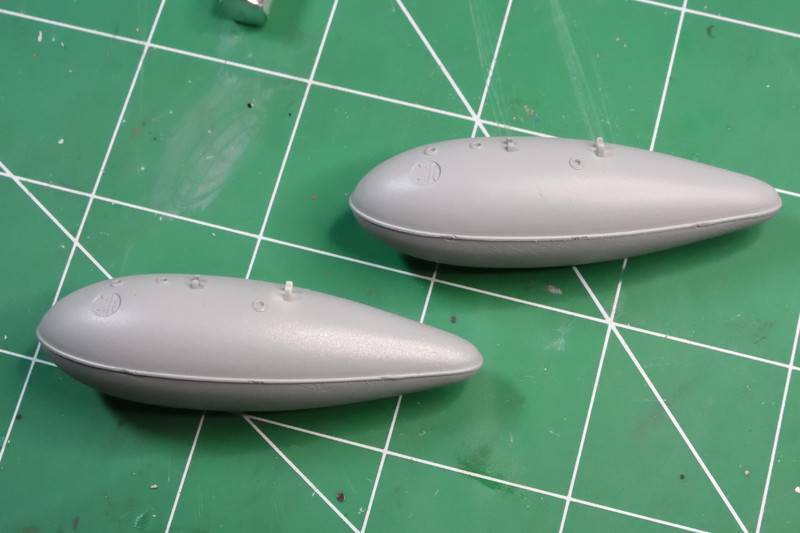 I've resprayed the drop tanks so they are more of a metallic aluminum than the gray I had them. Trying to get them an off-shade from the wing and fuselage but we'll see if I succeeded. I may hit them with a matte clear but have not decided on that yet. Regarding the exhausts - too late! Fuselage is closed up so I will just have to fiddle with it to try and get it to work. 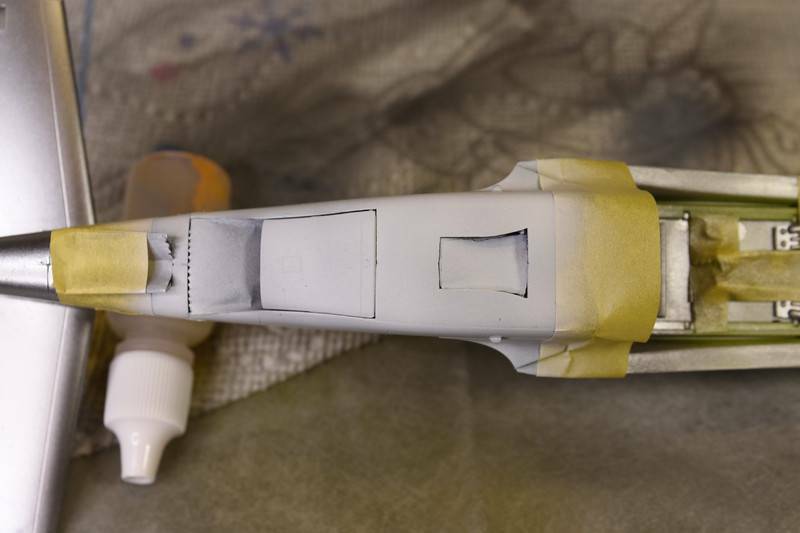 After the nose receives its yellow paint we'll give that a go again. NOT damaging the paint will be a challenge. Interesting also is the lack of exhaust soot n the aircraft in the picture. Something tells me this was a staged picture and all of the aircraft were nicely cleaned up for the shot. Tried to vary the shade a bit before I highlight individual panels but hard to see in the photo's - looks more like a shadow. All Vallejo Aluminum Metal Color. 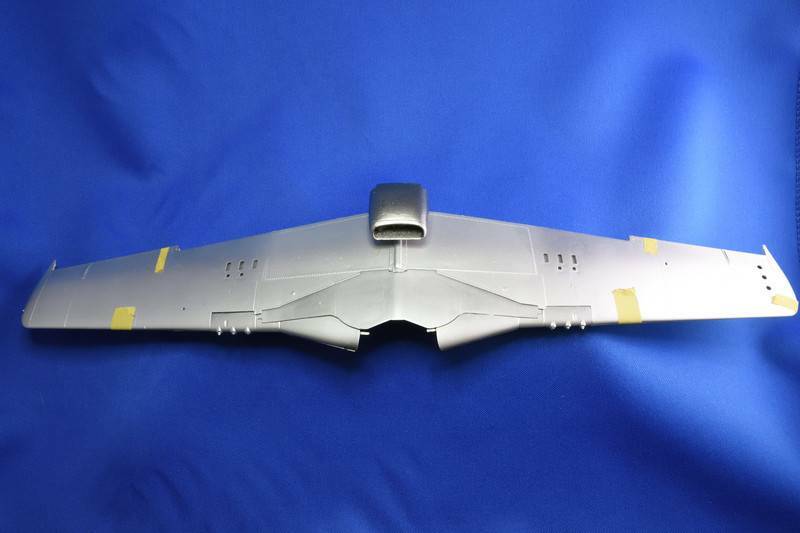 The wing tip and wing root are both Tamiya Lemon Yellow, while the middle is Vallejo Yellow 71.078. Other than the Tamiya being naturally glossy, the Vallejo yellow has a distinct brown-hue to it compared to the Tamiya. 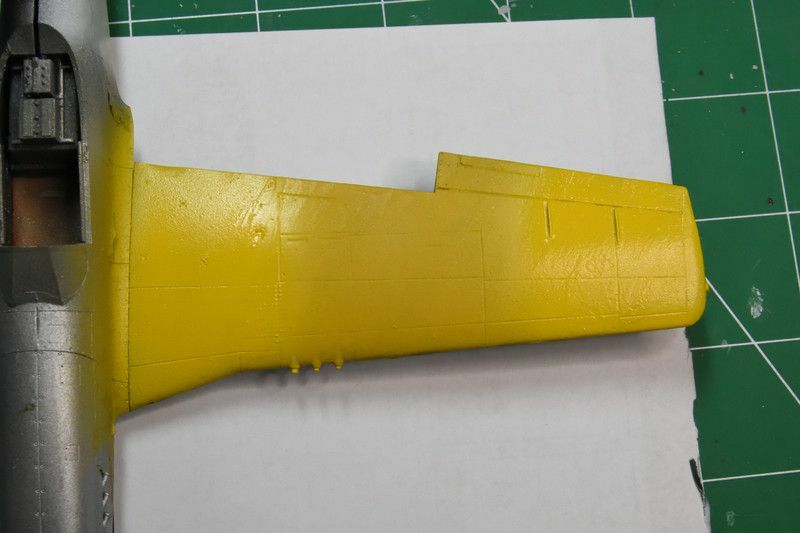 Despite the fact that I dropped (kind of launched actually) the Tamiya bottle when I was opening it (yeah, that took a LOT of clean-up to fix), I think I'm going with the Tamiya Lemon Yellow for the nose. The pictures from Dana show a pretty bright yellow on LouIV (the full sun picture helps a lot with that I think). I have the K-2487 Cropped picture as my computer background so I stare at it a lot these days. Peter: You have a REALLY good eye for color. Looking at my screen, I think I would have to lighten the Tamiya yellow by about 10-15% to match, but then when I look at the other birds in the flight, esp S and A, I'm wondering if the lightness of LouIV is just the full sun on the nose? LouIV's spinner seems to be pretty close to the Tamiya yellow... We'll have to see. That's why using photos both in print (dyes) and on the screen is iffy. I'm thinking your pretty close with the lightening percentages. Looking forward to seeing the test pics. PTO (obviously higher temps to deal with). I've only seen it on PTO a/c. Mike, I winced when I saw your message, but you are right, needs to be removed and I don't think it will be that hard to do - thanks again for pointing out! Ok folks - THEY'RE HERE! THEY'RE HERE!! 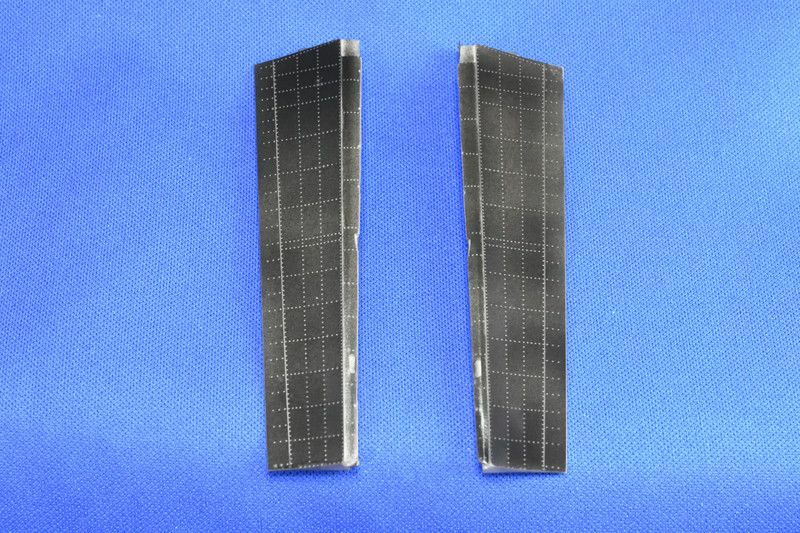 The AMUR flaps arrived today so stay tuned for pictures. Yes, they look amazing. I have pictures in resin, primed with black gloss primer, and Vallejo White Aluminum Metal Color. ONE rough spot to deal with on a corner, but otherwise they are exquisite and I compare them to the Tamiya kit (pretty close!) 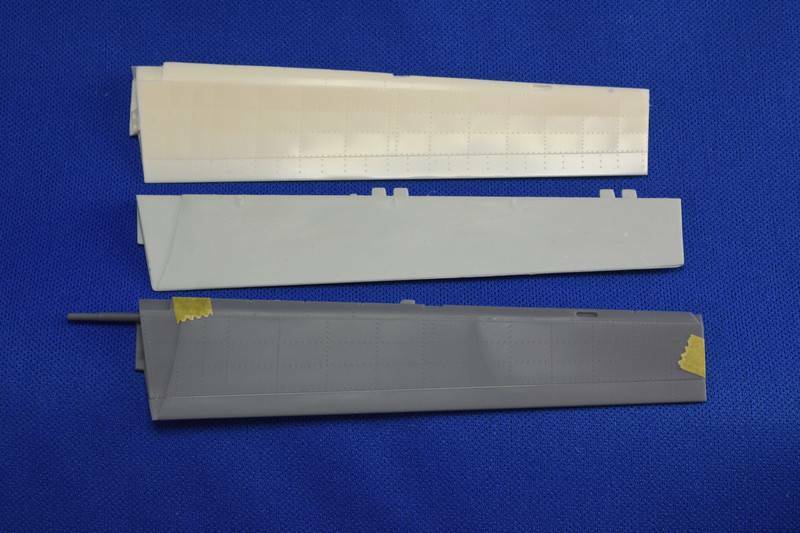 and Revell kit (no comparison) flaps. Caps are playing game 7 vs Lightning so listening in and taking periodic breaks. Plus letting the Metal Color dry for a few hours before I take some more pictures. 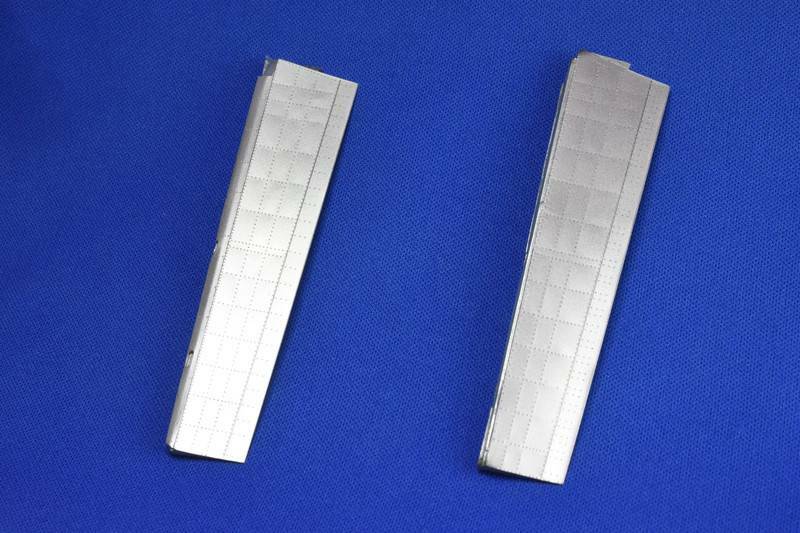 I will write up a full review, but I'm very happy with the AMUR flaps. Wow. 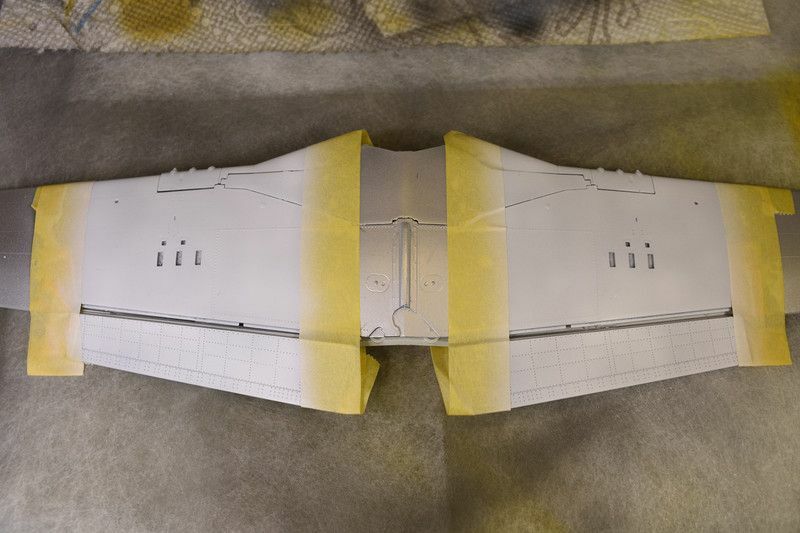 Sprayed the exhaust panel (which is only half 'bare metal', the top half is yellow) using Vallejo Dark Aluminum, which from certain angles doesn't appear dark at all. Go figure... Still have not taken off the PTO battery cooling scoop from the left side of the fuselage. 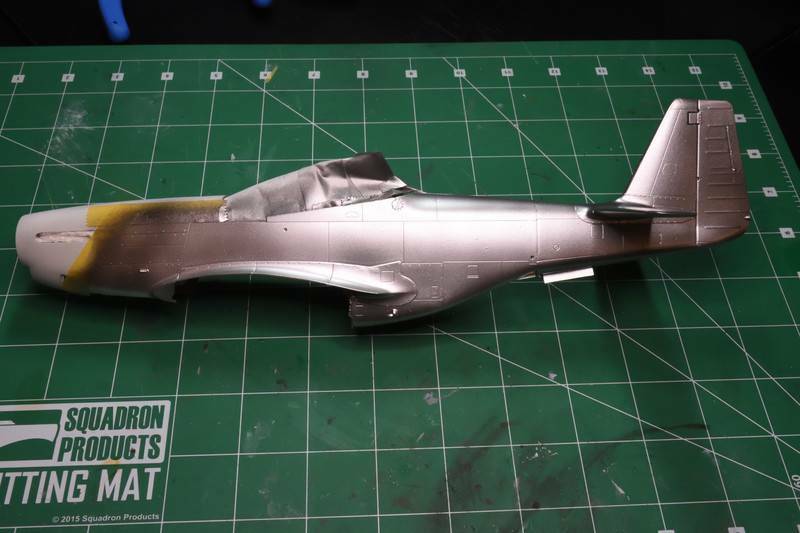 Working on the silver base for the underside of the wing prior to painting the DDay Stripes. The bomb/fuel racks are not yet attached as I've seen a number of photo's where they were not painted with the stripes. I'll add them after the stripes are painted. 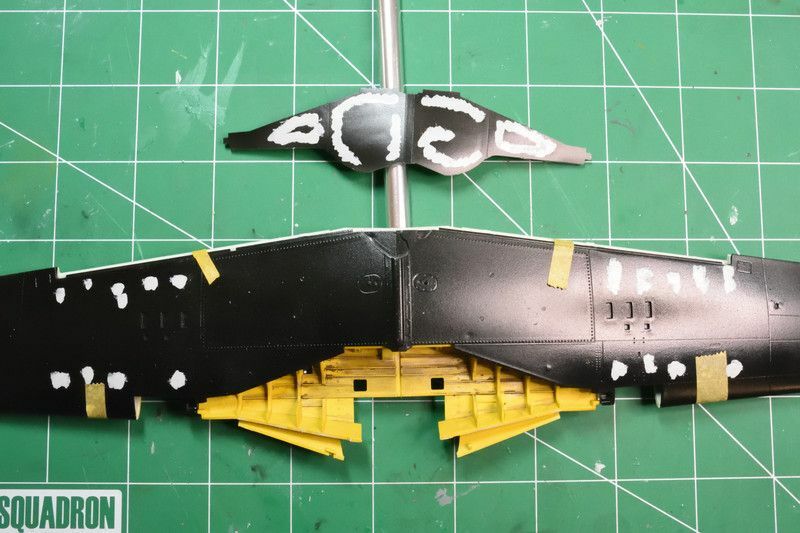 The landing gear covers are still one piece to use as a mask for the wheel wells and for painting the bottom DD stripes. 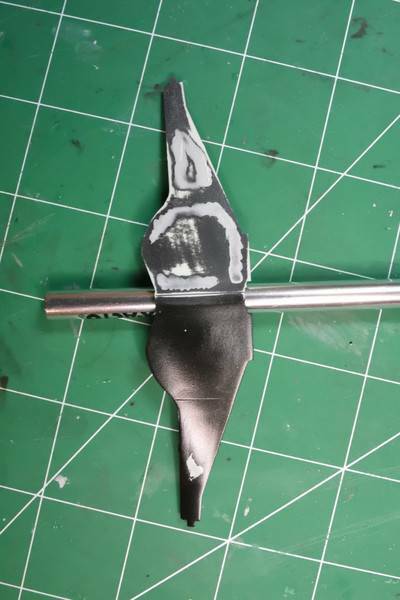 They are painted White Aluminum to give them and then the rectangle by the scoop some variety of color (which really not much will be seen with the stripes, but I know...) the scoop is actually Dark Aluminum as well but will see how it all looks once its put together. Easy enough to over spray. On to those gorgeous flaps. I will do a full review, but here is a sneak peak. 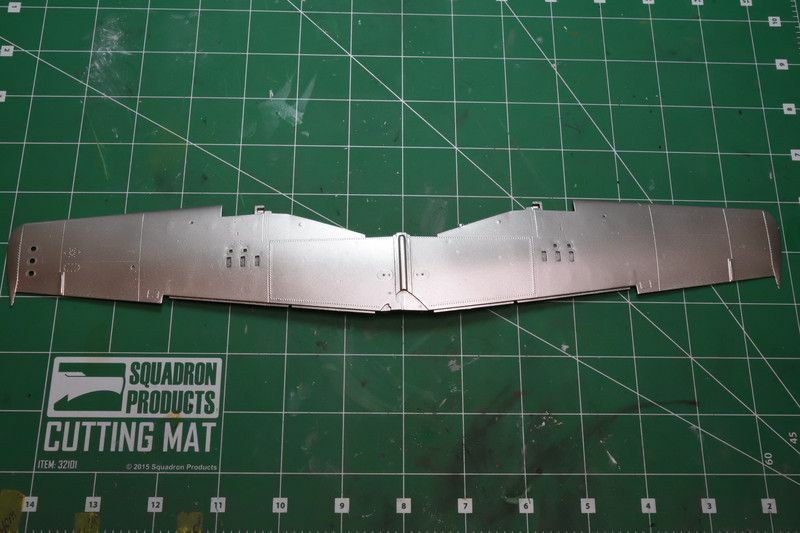 The AMUR flap is up top, next is the Revell kit and at the bottom is the Tamiya kit flap. 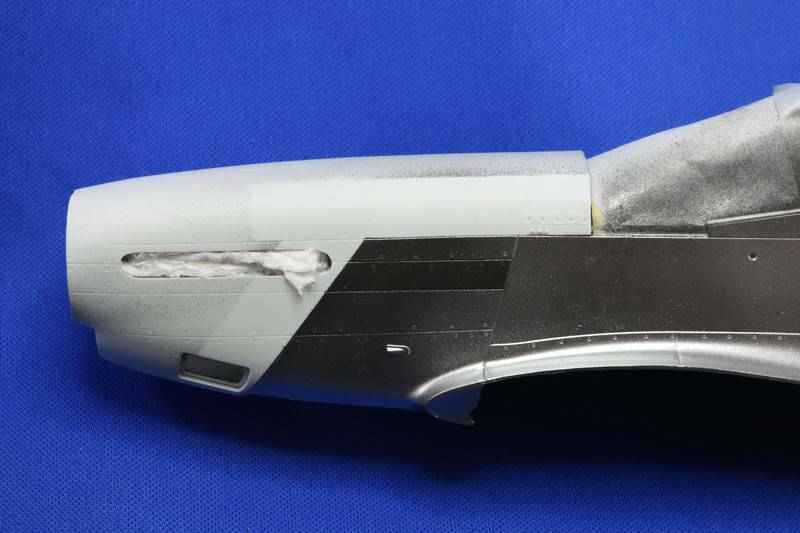 The Revell flap is just flat - no detail at all, but has that nasty 'groove' down the length. 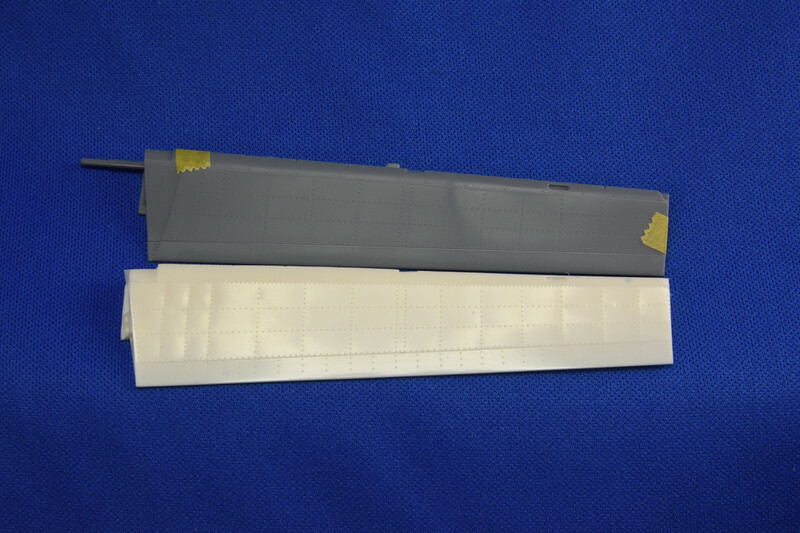 The Tamiya flap has the amazing detail comparable to the AMUR flap, but is the wrong shape - it is missing the slightly concave profile of the real flap. 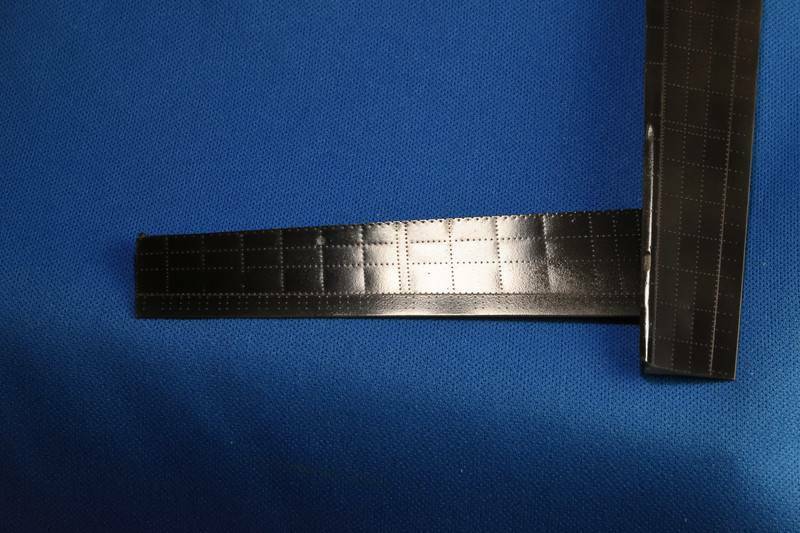 So the AMUR flap looks the best part matching the natural Mustang flap profile we've seen in the pictures. Here is where the photo can be deceiving: They all look like they are different sizes, don't they? They are all exactly the same size! The photo was taken at an angle. So on to the flaps. Here they are sprayed with a light coat of Vallejo Gloss Black Primer to highlight the amazing detail. And finally in Vallejo Metal Color White Aluminum. 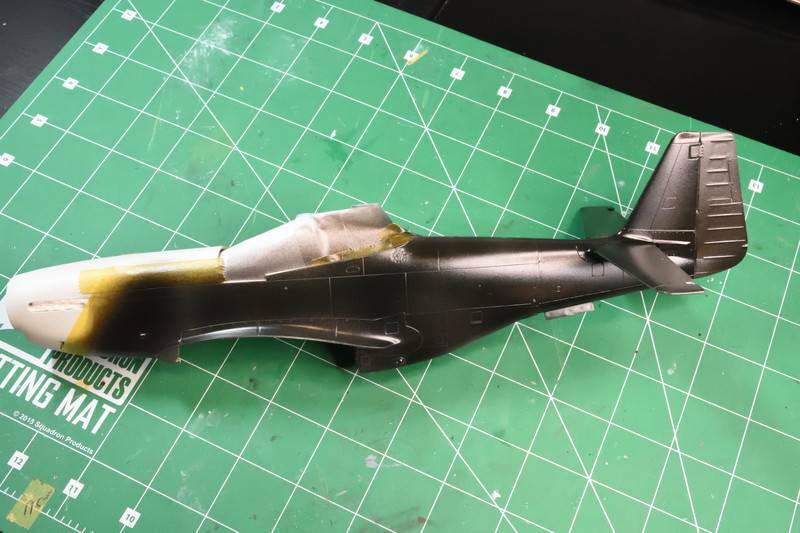 Next, need to fix that errant battery scoop on the front of the fuselage and then get the yellow on the nose and the Black and White stripes on the bottom of the wing and the black stripe on the elevators. Then wire the landing gear, and the drop tanks. Still a LOT to do! 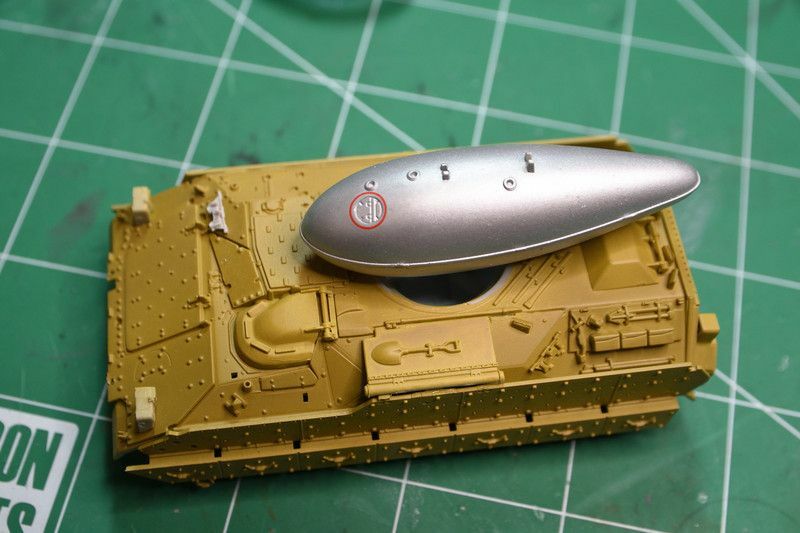 Check out the drop tank holder while I apply the decals. And painted. Vallejo white with about 1/3 Vallejo gloss to help with future masking. 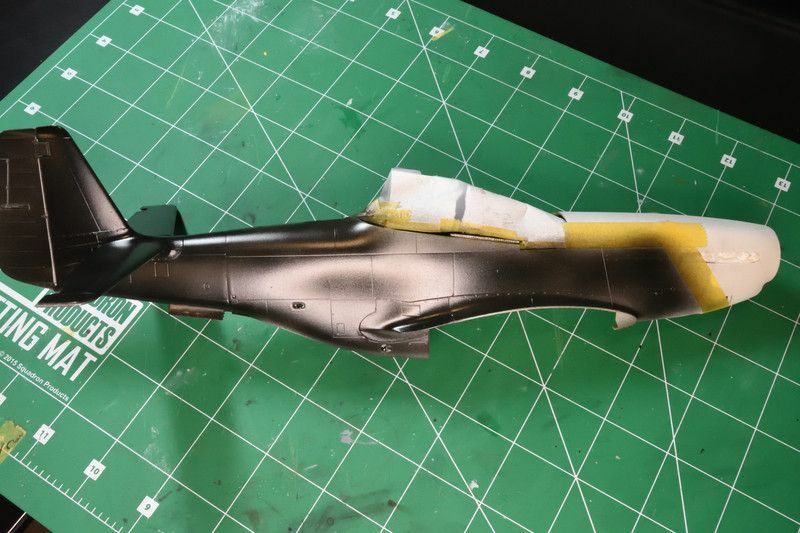 Will let this dry for a day or so, and am looking at fixing the fuselage battery scoop and getting the yellow on the nose, as well as the black stripes on the elevators. AND get to work on the canopy and front windscreen. Whatzat, a Bradley? I'm pretty out of touch with modern armor.